We love the way that the huge boulders at the lodge's location have been ingeniously and stylish incorporated into the design of several of the suites as well as the main lodge – check out the lodge's bar for a perfect example! What could be better than viewing game from the comfort of your own private deck and plunge pool - and even from your bath or shower! 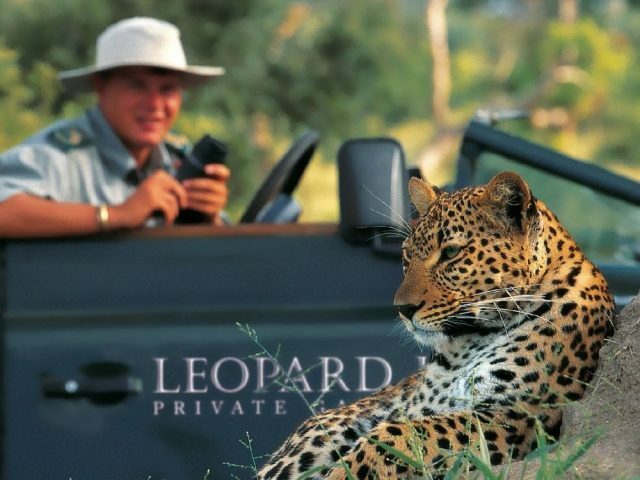 The lodge makes use of both rangers and trackers which we always find to add to the game viewing experience- and your ranger will often dine with you too where he'll regale you with his entertaining bush tales! It's a longer drive to get there as the lodge is an hour's drive inside the reserve from the gates – then again, think of it as your first game drive! Quite pricey compared with most other Madikwe lodges (more on a par with mid-range Sabi Sands lodges) – then again it is way more luxurious too! the honeymoon suite has the ultimate outdoor bathroom experience - a very private outside corner set amidst the boulders and trees where you can soak in a standalone outside bath whilst enjoying views of the reserve! Don't get us wrong, at Bushscapes we absolutely love simple little authentic bush camps where the focus is squarely on the wildlife and bush experience – but we would also be lying through our teeth if we said that we didn't also love lodges which are luxurious and pampering! And the absolutely gorgeous Madikwe Hills is a perfect example of a lodge which offers superb luxury whilst still offering a genuinely excellent bush experience! The lodge is located on a rocky outcrop boasting gorgeous views over an expansive plain complete with active waterholes. It's been set amongst age-old Tamboti trees and massive boulders, many of which have been ingeniously incorporated into the lodge's construction – for example the lodge's bar has been built around an impressive boulder (lends quite a different meaning to “whisky on the rocks!”) and an old tree trunk. There are 10 luxurious suites as well as a private camp, called little Madikwe Hills which lies nearby – but for our purposes we'll concentrate on the main lodge. 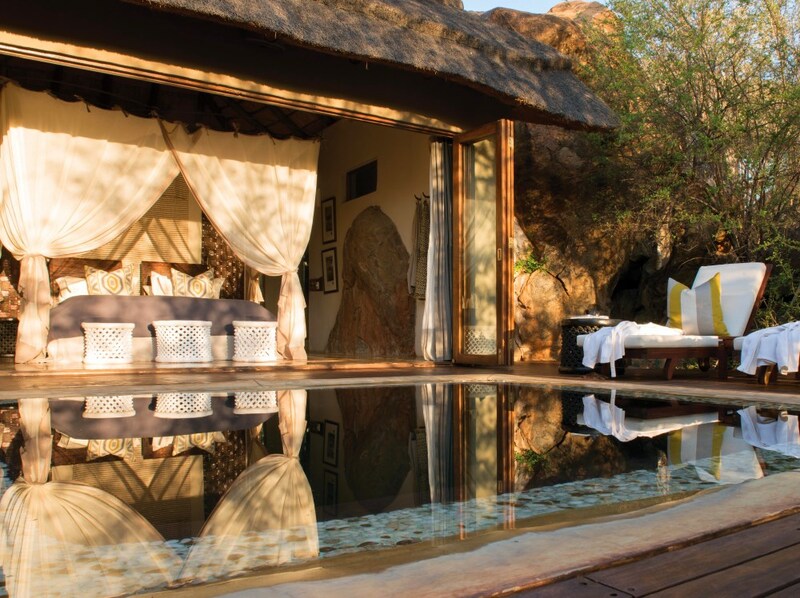 Whilst the 10 suites at Madikwe Hills are certainly very spacious (150 sqm!) and luxurious, the décor is extremely elegant and classy and the lodge is in no way ostentatious or pretentious. What we absolutely love is the floor to ceiling glass fronts to the suites which lead out to your expansive wooden deck complete with private plunge pool – it really opens up the room to the bush and views outside rather than divorcing you from nature as is unfortunately the case with some top-end lodges. 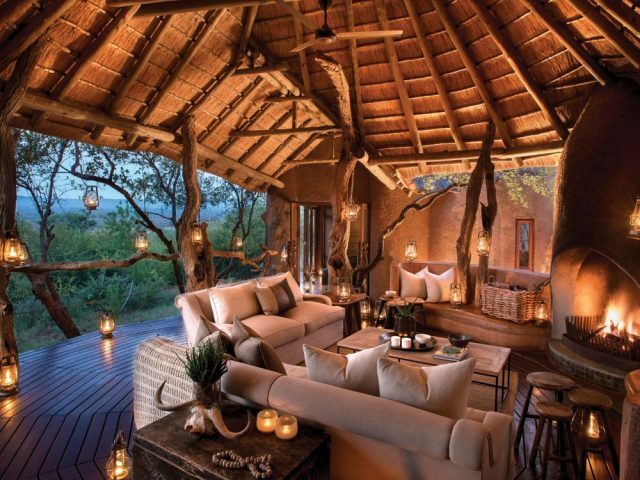 Here you can simply lounge about your suite or on your deck and drink in the views of the animals coming down to slake their thirst at one of the lodge's waterholes! The suites are wonderfully relaxing spaces with subtle décor that successfully integrates natural elements with an earthy neutral colour palette – yet at the same time they boast seriously luxurious aspects too, with massive king size beds ready to embrace you in the finest linen under voluptuous mosquito nets and comfy sofas in which you can slump with a good book in your private lounge. Fireplaces make the suites cosy in the chilly winter months, and in summer, overhead fans and air-conditioning provide welcome respite from the dry heat. The heavenly en-suite bathroom comes with an outdoor shower and a bath with concertina glass doors that open the room up entirely and add to the romance and feeling of connectedness with the bush. 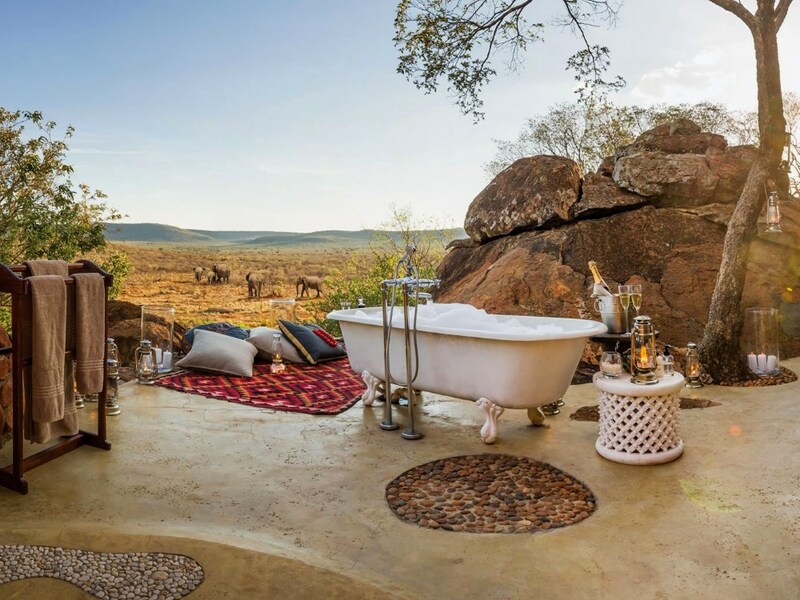 The honeymoon suite though has the ultimate outdoor bathroom experience - a very private outside corner set amidst the boulders and trees where you can soak in a standalone outside bath whilst enjoying views of the reserve! The main lodge area at Madikwe Hills is just as stylish and embracing - age-old Zanzibar doors open into the lounge which is stocked with beautiful books waiting to be read and explored, whilst the bar entices you to enjoy a pre-dinner drink and fireside chat with your friendly game ranger. The main deck again overlooks a waterhole and is the perfect place to relax with a cocktail around the main swimming pool which provides welcome relief from the heat of the day. As you would expect of a lodge of this quality, the food at Madikwe Hills is superb and gets consistent rave reviews. The entire dining experience is very special, with the lodge making sure that dinner venues are varied – one night you could be eating next to the fire on the main deck, the next in the lodge's boma under the night sky. And if you fancy something truly romantic then how about a candlelit dinner on the private deck of your suite for the two of you! Wildlife at Madikwe Hills can be viewed on both games drives and walking safaris (and from the privacy of your own suite's viewing deck of course!) State of the art open 4x4 vehicles with bucket seats and fold-down armrests stand ready to take you on twice-daily game drives with a knowledgeable ranger and tracker – Madikwe Hills is one of the few lodges here to also utilize trackers and we feel this is a big advantage, especially on the night drives where to expect the ranger to drive, operate the spotlight, spot game AND interact with guests is asking a huge amount of them! And to end it all off, Madikwe Hills is one of a decreasing number of lodges today where the rangers often dine with guests, something which we think can add immensely to the whole experience as they regale guests with their entertaining, interesting and often amusing tales of the bush! At Main Camp children over the age of 10 are accepted but is restricted to just one child sharing with two full paying adults at 50% of the adult rate.